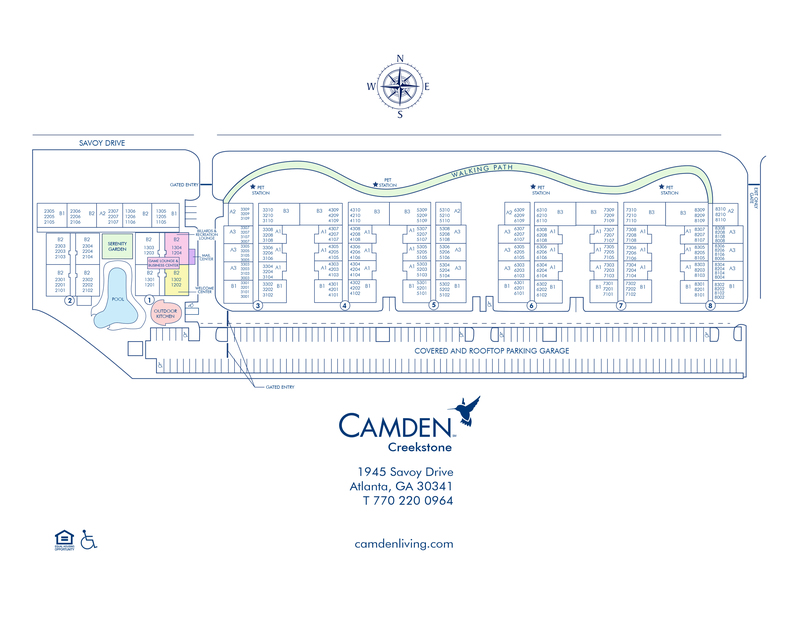 A charming and quaint community inside the perimeter (ITP) is rare – and when you live in a one or two bedroom apartment at Camden Creekstone, you will have it all. We are just minutes from great shopping at the upscale Perimeter Mall, Phipps Plaza, and Lenox Mall. Fabulous restaurants such as Cheesecake Factory, Brio, Season's 52, Eclipse Delano, J. Alexander's and Joey D's Oak Room just to name a few are only minutes away! Love Brunch? La Madeleine French Bakery & Café and Egg Harbor are the spots to be. You can grab your everyday grocery needs just down the street at Publix or Kroger. With easy access to Marta at Dunwoody Station and the convenience of living directly off of Highway 285, 85 and 400, our location makes it easy for you to commute all across Atlanta. Custom comforts like a full-size washer and dryer, ceiling fans, modern gray plank flooring and large walk-in closets will help you feel right at home. Our open concept kitchens are ideal for cooking your favorite home cooked meal. With stainless steel appliances including a microwave, sleek gray cabinetry and white quartz countertops; it is a great place to cook by yourself or with your family. Relax with a glass of wine after a long day on your patio or in front of your fireplace on a cold night. Camden Creekstone is a perfect place to call home. Whatever you like to do in your spare time, you will love taking advantage of our non-smoking amenities. Our pool is calling your name! Put your feet up and enjoy the weather on our sundeck next to the salt water swimming pool or grill some burgers and hot dogs with your friends at our outdoor grill and picnic area. Do you like to work out? Our 24-hour fitness center has cardio equipment and free weights for you to use to keep in shape. Also, the Dunwoody Cycle Bar is just around the corner with spin classes! The business center is available if you need some extra workspace. You can even print documents from your apartment and pick it up at the WiFi internet cafe printer after you enter your special code. Find your zen in the relaxing courtyard with comfy chairs to put your feet up and the sound of calming water from the beautiful fountain. Go for a stroll on the walking path where you can walk your furry friends! Did you know we welcome three pets per apartment? Your pets will love it here too. Come home to Camden Creekstone where you will live the best of both worlds. Call today to make an appointment to see your beautiful new apartment home! We'll save a spot for you! We offer two spaces per apartment home with ample open parking available to residents and visitors on a first-come, first-served basis. Storage is available to rent with select apartment homes. Call us for details!